A few days ago on our Women Who Lift Weights Facebook Page one of our readers asked what I thought was the best exercise for fat loss and conditioning. In my opinion, without a doubt it’s sled training. I show them our sleds and I say “You are looking at them”. They look easy, but they are not. There are no motors, there are no fancy flashing lights, there are no calorie counting meters, there is no TV to watch. There is nothing but you and the sled. Most people don’t realize just how hard sled work is until they actually grab the sled and start pushing. I believe in the benefits of sled work as I use sleds in my own training. I also use sleds with pretty much every female athlete/person that I coach. Most people think that owning a gym and being a full time coach is a great job and makes it awesome for trianing. While I love coaching and love my business most times it’s actually harder to focus on your own training and your own goals. My business and my clients always come first. Over the last year I have been battling a hip injury that has really set back my PowerLifting training. When squats and deadlifts hurt it makes powerlifting difficult. Today I decided to get back at it and make the best of what I got. I can’t PowerLift the way I want to, but I can still train. Time to make the best of what I can do. One of my goals is simple. Do sled work every day. It doesn’t have to be a lot, it doesn’t have to be heavy, I just have to get it done. Day 1 sleds done and guess what, they are hard and still sucked but that is sleds! “You don’t have to like it but you have to do it” Happy to train. Everyone at my gym does sled work. It doesn’t matter if you are a new member coming into the doors of Heavy Weights that wants to lose some fat, or a high level Bikini Competitor or Power Lifter. They are all doing sled work. Here are 10 reasons why I love the sled and you should as well. Most big box gyms have machines for one reason, so the average person can push some buttons and get it working. At my gym HeavyWeights Training Center we have a rule. We use NO equipment that you plug in. Pushing a sled is very easy to teach and very easy to learn. I have seen very little injuries with sled work. Bottom line the sled is not going to push itself. You have to work hard overall. How we do “Cardio” at HW :). Great job Rebecca! As long as you add weight and make it challenging the sled will ALWAYS be a hard workout. It’s kinda simple really do 1 of 2 things. When it comes to sled you literally have unlimited options. Do it for time, Do it for speed, Do a Pyramid, Push It, Pull It, Do Sled Suicides, Do Sled Intervals. Literally the way you can do sled training is unlimited and you should always be able to make it challenging and fun (well as much fun as sled training can be). 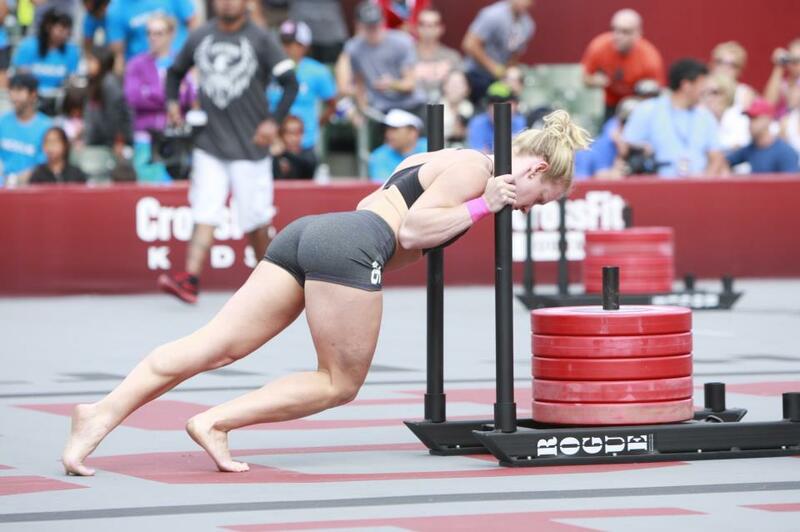 I have used sled work with women of all fitness levels with great results. It’s simple to do, you can’t really mess up pushing the sled, and no matter what fitness level you are at currently sled work can always be challenging. I love exercises that are self limiting. By self limiting it means that when you reach a certain weight you either get it or you don’t. A sled push is simple you either push it or you don’t. It require so spotting and if it gets too heavy you simply lower the weight. Self limiting exercises are great because the chance of injury is very very low. Sadly lots of people have hurt their backs doing deadlifts incorrectly, you can’t really mess up pushing a sled. The positives far outweigh any negatives. Why are sleds great for recovery? Sleds are a great recovery exercise and the main reason why is because they have no eccentric (no lowering). You shouldn’t get really sore after sled training. Sleds can be used for days off for “Active Recovery Days” or also after a hard leg workout to get the blood flowing. The key for sled for recovery is not to go too heavy or to crazy, remember it’s for recovery not killing yourself. Take a sled. Now at one end add a Kettlebell. At the other end add a bar. You just created a limitless variety of exercises. This can also be done with Body Weight as well. 10 Body Weight Squats – Sled Push – 10 Knee Grab Sit Ups – Sled Push – 9 Body Weight Squats – Sled Push – 9 Knee Grab Sit Ups … Repeat until no reps left. You can also challenge yourself for time on Pyramids which is a really great way to push your training. For some great workouts check out Sled Finishers Workouts but be warned these are only for women that want to work hard. If you have an hour to spend on a treadmill that’s great but I don’t have that much free time and the boredom would kill me. I like short intense high energy workouts that get the job done. Some women may enjoy steady state cardio, and while doing anything is good if you want the best results in the shortest period of time you can’t beat sled work. With sled work you can get an intense conditioning and fat loss based workout easily in under 20 minutes. So using the “I don’t have time” to workout does not apply to sled training. 20 Minutes of sled work is plenty! If you are short on time hit 3-5 sets of Sled Suicides which take under 1 minute each and you will get a full body workout like no other. With coaching my clients and my own training I always weigh in the chance of injury with exercises. I have had a laundry list of injuries (funny enough most are from outside the gym, except my back injury which was my own fault do to ego), so I want NO clients getting hurt and also i want no more injuries in my own training. The sled has very little chance of causing an injury as well it will help make your body strong and durable and able to deal with injuries and help you recovery faster. Sled work will improve glute strength, core strength, stabilizing muscles and lots more so the sled has numerous benefits for not causing injuries but also preventing them (double win). I want to add that in my 5 + years of coaching and sled work at HeavyWeights Training Center I have seen 4 people get calf/lower leg injuries from using the Sled. Considering we have had literally thousands of clients use our sleds I’d consider this very low. However, sled work can be very hard on the Achilles, calves and lower leg area so be sure to ease into it. As well pay attention to foam rolling your calves before and after training. This is very important. Lastly do not start out with sled work at a high speed until your body is ready for it. Like sprinting your body has to be ready for that type of movement so at first with your sled training be sure to go slow and steady. In my opinion I can’t honestly think of a full body training tool better than the sled. It can be used for conditioning, it can be used for fat loss, it can help build muscle, it can be used for sports specific training, it will straighten pretty much every muscle on your body and it will also test your soul as much as it tests your body. For some of the best sled and sled variations check out www.RogueFitness.com (I love their Dog Sled) and the T-Nation Prowler or check out Amazon.com for a variety of sleds big and small. Looking for some intense and challenging sled workouts? Check out my Sled Challenges Finisher Workouts. If you did please comment, like and share.